Wordsmiths of all skill levels will thoroughly enjoy Nintendo's puzzler. Having just returned from a relaxing cruise to Bermuda, I'm happy to inform you that Crosswords Plus was a great poolside companion. Currently available at retail and as a download on the eShop, this feature-packed 3DS title contains over 1,000 crossword puzzles divided into four difficulties (easy, medium, hard and expert), along with a variety of additional word games. We can certainly agree to disagree about the minimal presentation and sparse 3D effects, but Nintendo's delightful head scratcher should definitely make its way into your collection. It starts with those aforementioned crosswords, complimented by a useful hint system and simple-to-use touch screen controls that, for the most part, make navigation a breeze. There's a timer, but Nintendo never puts pressure on you to finish quickly, giving you the opportunity to kick back and go at your own pace. As for the other word games, you have Wordsearch, where you hunt for a series of words trapped within a jumble of letters; still fun after all these years. Then, there are Anagrams, tricky puzzles where you attempt to make a set number of words from a collection of letters; tougher than it looks. Nintendo then completes the collection with Word of the Day, which ties into Word Paths, where you take all those words and somehow connect them all. There's also free puzzles via SpotPass and StreetPass, but admittedly, this was impossible to check out in the Atlantic Ocean. In regards to negatives, yes, the game doesn't push the 3DS graphically, nor does it wow in the glasses 3D department; you receive brief animations for completing puzzles, nothing more. I also found that the game had difficulty recognizing certain letters, namely capital D and B, often mistaking them for O; for some reason, lower case seemed to work best. What's more, the game has a tendency to switch back to the currently highlighted word as you spell out a different one, which is a minor annoyance, but it doesn't ruin the experience. 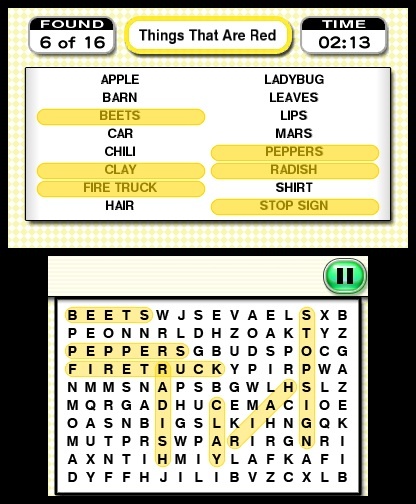 That said, you might be put off by the easiest puzzles, which take only a couple minutes to complete. On top of that, you have to unlock the other difficulties, so expect a bit of grinding before taxing your brain. 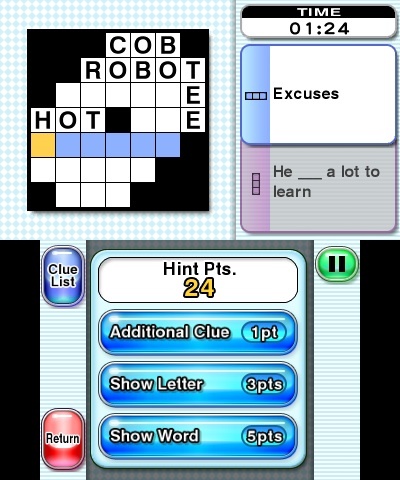 I also noticed that some words repeat across different puzzles; again, not a huge deal. Taken for what it is, however, Crosswords Plus is one of the handheld's more enjoyable and satisfying puzzle games, one that overflows with value. It lacks visual punch, but pound for pound, it goes quite well with a tropical drink. What's Hot: Over 1,000 crossword puzzles and other word games, free puzzles via SpotPass, user-friendly touch controls. What's Not: Words sometimes repeat, you need to unlock tougher puzzles, the game occasionally misreads letters.